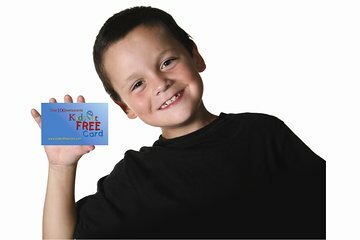 Children can dine for free at more than 100 restaurants in the Orlando area with the Kids Eat Free Card. Simply present the card to the server or host at great restaurants like Ponderosa, Dominos Pizza, California Pizza Kitchen and many more within the designated Orlando region. Then enjoy breakfast, lunch or dinner. Children must be 11 years old and under. One free meal per full-priced adult entrée purchased. Upgrade your card to the Kids Eat Free PLUS for additional bonuses at some of central Florida's favorite family attractions such as Gatorland, Fun Spot America and more! The card is valid for 90 days from the first day of use. I recently stayed over a week in Orlando and the card more than paid for itself by the second day. There were several choices at Universal City Walk which is the entrance to the park and was very convenient. There were a variety of choices that we could use anytime of the day unlike most of the kids eat free programs which are on certain days and times. This card is a must have if you are planning a trip more than a few days in the area. My only problem was that we have to go to a tour place not exactly close to us to redeem it. Lucky we had a hire car but not til our 4th day so we missed out using it for the days we didn't have it. If we do not have to go redeem our booking at a tour operator for park tix we should not have to do this.